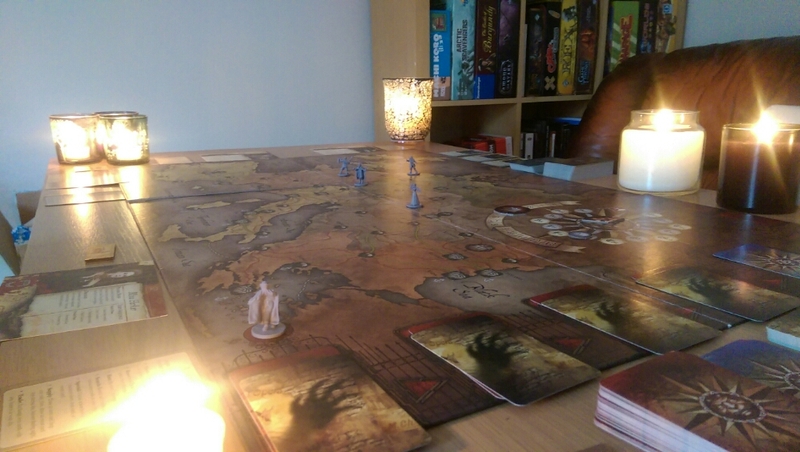 Posted on November 30, 2015 by thelostlighthouse	in Board Games, Gaming, The Tabletop Project and tagged 2-5 players, board game, board gaming, Fantasy Flight Games, Fury Of Dracula, Games Workshop, hidden movement, TLL, tllgaming. Moonlight flickers between the rushing trees, an owl hoots, you hear an eerie sound, not too dissimilar to a coffin lid opening. He’s back! 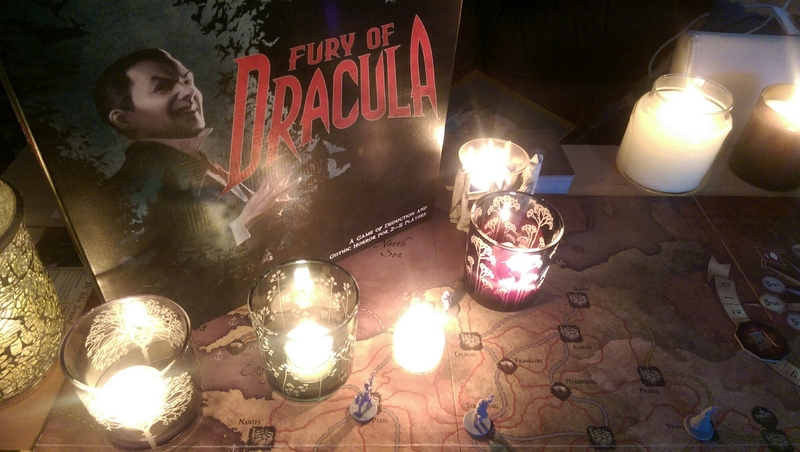 The Count has arisen for a 3rd edition of Fury Of Dracula! Now, this game has a lot of fans and I’m not just talking about this edition. Previously made by Games Workshop, Fantasy Flight Games has picked up the license for Fury Of Dracula since the 2nd edition. Copies were selling for such escalated prices on eBay, that it seemed impossible for the standard gamer to get a copy. Then FFG announced the 3rd edition release! I was excited, as pretty much every avenue of board game media said this is a “must have” in our collection. Sadly I couldn’t afford Fury Of Dracula for Halloween but as the long, windy, nights draw in, pretty much every night is scary! I won’t go into the differences between this edition and the others as that’s the past and this incarnation is very much the present. Before the rules, let’s talk about components. 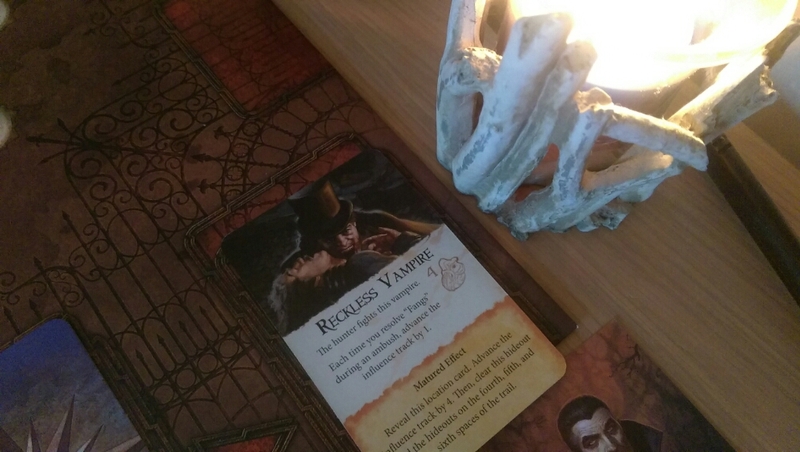 Fury Of Dracula is refreshingly light on components compared to most FFG games. All are good quality but it’s nice to not take half an hour setting up before even explaining the rules to people. The Dracula miniature himself makes me giggle as he looks a little bit like a vampire cosplayer that has been caught on the wrong end of a man hunt. The board art is amazing but I fine the colour palette a little drab. He appears from the shadows! Up to 4 people are Hunters, while 1 person takes the role of Dracula. 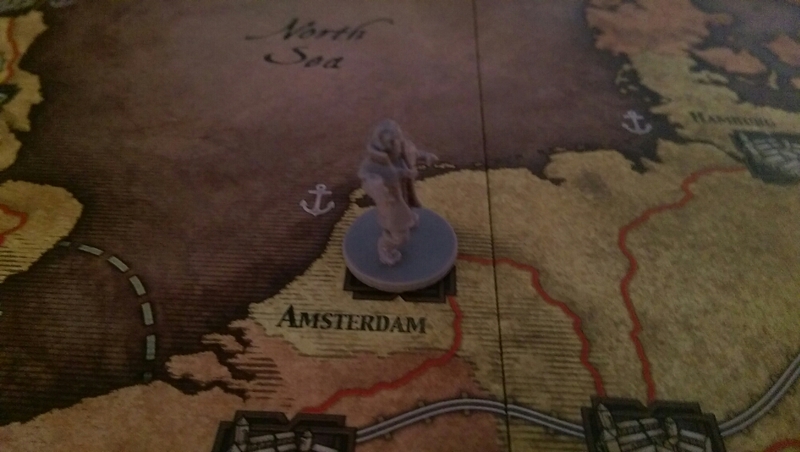 The hunters win if they find, and kill, Dracula and Dracula wins if he elevates the influence track to 13. The rules are pretty simple once you get going, but can be a bit difficult to get your head round to start with. The hunters take 2 actions during their turn, one during the day and one at night. These action can be simple things like moving or reserving a ticket to searching a city for the count himself. Dracula has a bit more to think about, he has to try and move from city to city, unseen, hoping the hunters don’t pick up his trail! A cheeky visit to Amsterdam! The trail is where the excitement takes place in Fury Of Dracula. Everytime Dracula moves he places a facedown location card on the trail, which slides along the trail every time he moves. He also gets to place an encounter card on that location card, which could be an event that delays the hunters if they find that location, it could be a vampire Dracula has left there to try and kill them, or something in between. There’s a lot of options for Dracula and his encounters. If the Hunters move to a space where Dracula has been, Dracula has to reveal the location card and choose to reveal the encounter card or not, as it maybe a card he wants to mature (more on that later). Once the hunters find a location he has been to they can start to work out where Dracula maybe now and start a more focused hunt. 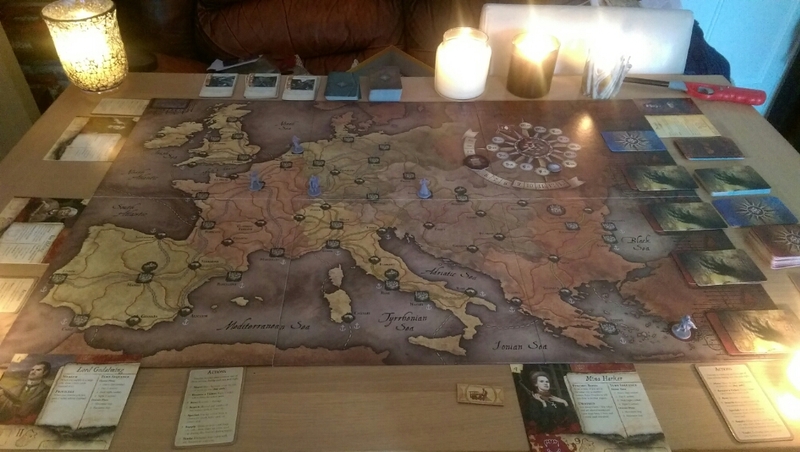 Dracula wins the game by gaining influence. He does this by ether biting a hunter in combat, maturing an encounter card, or defeating a hunter in combat. Maturing an encouter card means that it didn’t get discovered by the time it slides of the end of the trail. Combat in the game is nice and simple, it takes a few goes to get used to it but it’s good. In a nutshell, the hunters and Dracula have their own combat cards that they play face down and then flip at the same time, if the symbols match then the hunters card takes effect, but if they do not, Dracula’s card takes effect. Dracula is tough but if he gets set upon by 2 or more Hunters then he needs to escape asap! I know this from experience! 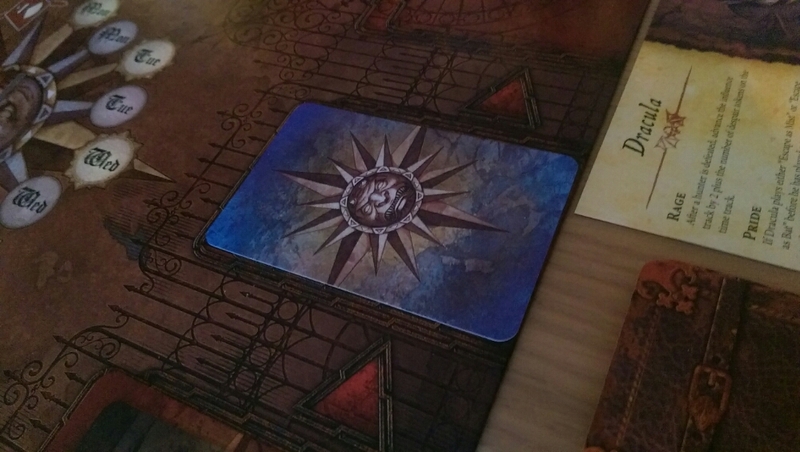 Now a thing to consider is that FFG also make Letters From Whitechapel, another great hidden movement game. 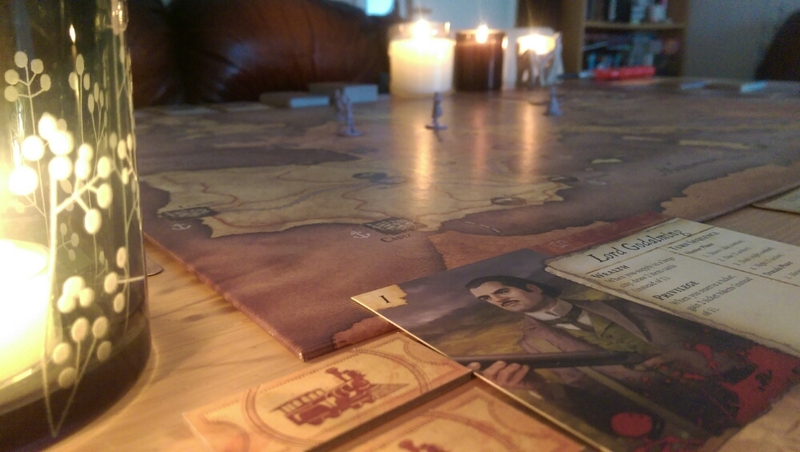 With a few less rules Whitechapel is a smoother game overall but I much prefer the setting and mechanics of Fury of Dracula as it’s not just a game of hide and seek. 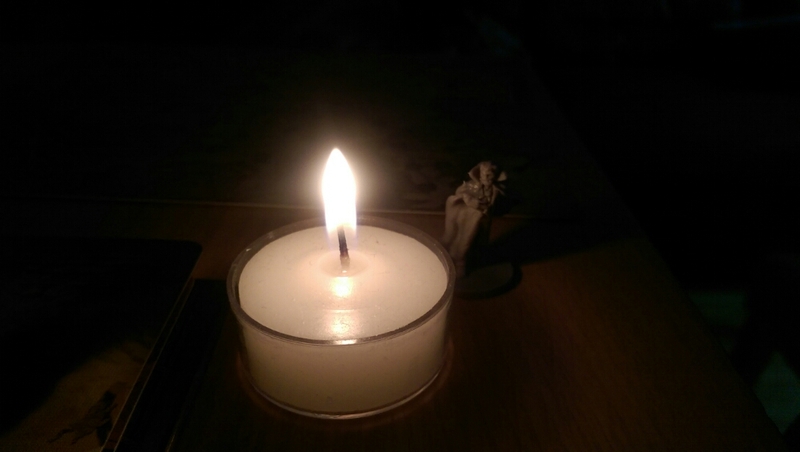 I really like Fury Of Dracula, being the Count is so much fun, all be it nail biting at times. When the hunters are talking about cities no where near you, you are laughing but then when they have you trapped and they don’t even realise, you’re sitting there in a cold sweat! I’d say it works best as a 5 player, as then it’s 4 hunters deciding by themselves where to move rather than one or two people controling all the pieces. If you haven’t got a hidden movement game in your collection, make sure this is it! P.s A tip if you’re ever Dracula, wear a cape, it’s the best and never travel by sea, it’s the worse! Don't travel by see, trust me, just don't.